When I moved to Chicago, I was eager to find a place that felt like home. After a day of looking at places that were mostly duds, the last place I found just felt right. It had almost everything I was looking for–hardwood floors, stainless steel appliances, a brand new washer and dryer, an easy walk to Lake Michigan. I moved in a week later, and before long the place started to really feel like my own. After about a month of peace and quiet, and a building all to myself, my upstairs neighbors moved in. They looked friendly enough when I awkwardly peeked through the blinds as they unloaded their moving van. I told myself there was no way they could have known that they timed their arrival perfectly for my 3 p.m. bedtime. And that a little stomping up the back steps was to be expected; I mean, really, who moves quietly? Within a few days, I knew this was going to be trouble. I’d noticed how thin the walls were when I heard the maintenance crews clomping up and down the steps and the mail lady swinging the door open and slamming it shut. Now I learned that the ceiling was just as thin. I could track my new neighbors’ movements by the shifting creaks above my head. And most days, I was treated to my own personal concert echoing through their floors. I consider myself a relatively patient and understanding person, so I told myself that they were probably using music to pass the time while they unpack. But by the second week of second-hand tunes, I knew it wasn’t going away, and I was starting to get cranky. For the sake of my sanity, I knew I’d have to find a way to ask them to turn it down. This shouldn’t be a big deal, but I spent another week asking people whether I should leave a note or knock, and if I left a note, what should it say? I’d like to say my problem is that I’m too nice, but that would be too nice. The bottom line is, I hate confrontation. And maybe, I’m afraid people won’t like me. Besides, given that I was dealing with people I’ve never met, there was the whole question mark of whether confrontation would end with slashed tires, or worse–them spitefully turning the music up louder. So this week, at my wits end, I finally got up the nerve to leave the note. I saturated it with politeness, and hoped it wouldn’t be the worst first impression I’ve ever made. I wrote, “Hi there, Can you please lower the volume of your stereo? 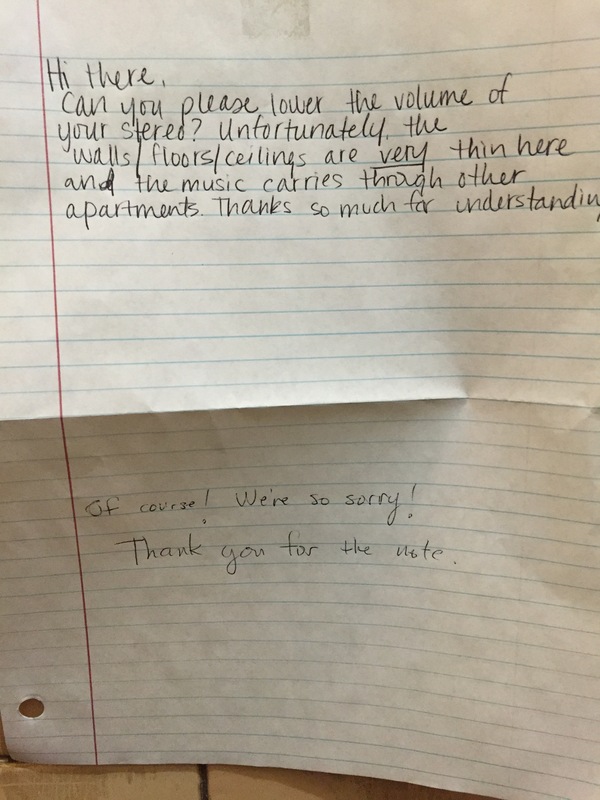 Unfortunately, the walls/floors/ceilings are very thin here and the music carries through other apartments. Thanks so much for understanding.” I taped it on the door, walked down the stairs, considered running back and taking it down, and then just hoped for the best. It seems sometimes politeness can go a long way. I was mildly shocked too. But I can’t help but think their response might not have been so easygoing if I’d snapped and reacted in anger. It’s just one more reason to treat people around me with kindness and respect. And a small reassurance that, yes, reasonable neighbors do exist. You’re just simply a good person and the universe celebrates you!